Great Basin Seeds strives to help solar developers with professionalism as your source for seed supply and land consultations. Solar farm reclamation is a diverse field. A native landscape on your solar site will provide water control, can increase public support for your site permits, create a more attractive solar site, reduce long-term maintenance costs and provide invaluable pollinator habitat. If the governing land agency has prescribed a seed mix for your site, give us a call. We can send you a quote. Your solar farm reclamation needs vegetation that allows water to flow into the soil. This is especially important on sites adjacent to wetlands and other waterways With the right seed and establishment, native landscapes provide fantastic water control and excellent soil conditions. We at Great Basin Seed supply hundreds of native and introduced seed options. We can help you in choosing a custom seed mix for your solar farm reclamation. 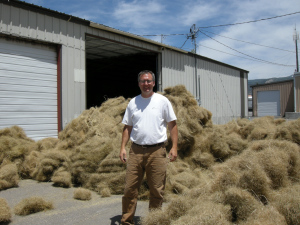 At Great Basin Seed we harvest diverse mixes of grasses, flower species, forbs, and shrubs covering millions of acres across the United States. We hand-pick local seeds that can flourish most anywhere with similar conditions and minimal attention — lasting for the duration of your project. A mix of hardy native plants pays for itself in the first three to five years by avoiding maintenance costs on a large-scale site. Cost savings over multiple years has been one of the primary drivers for an increasing number of public works, corporate and large-scale native landscaping projects. Let Great Basin Seeds be your landscape consultant and seed supplier. Call us today and see how we can help with your solar farm reclamation!